You’ve optimized your content with SEO. Now you’re definitely going to rank for your keywords. But it didn’t happen. You can’t seem to find your content anywhere. It happened to me and that sucked. You’re probably wondering why this happened after you’ve put in so much effort to optimize your content with SEO. Is it a content issue? The unfortunate answer is – yes, it is a content issue. Quite a while back, Google released an update named Google Panda, and this adorable black and white creature is the one who is penalizing you due to your content quality. Google does have a very good reason for penalizing websites with low-quality or “thin” content. Prior to the update, short and spammy pages were a common sight. This defeats Google’s purpose since providing valuable information to users is the goal. As a content creator, you would want to provide genuinely useful content to users, but there could be issues holding you back that you were not aware of. To rank well and help users see you and get to know you, you would need to avoid thin content. While it is not always the intention of the writers to produce thin content, there’s just no way for a search engine to understand that. The only thing we can do is to take necessary steps to avoid it. Is Duplicate Content The Same As Thin Content? There are several types of duplicate content. The first one is complete copies of a page but has multiple URLs in one website or even multiple websites that always bring you back to the same page. Since Google views every URL as a unique one, every copy that is found will cause your content to be considered thinner. The first is a complete copy. These are completely identical content that is pasted across different pages or websites. Every copy that exists will be penalized and Panda will chew you up like bamboo stalks. The next one is partial copies of the content across multiple pages or websites. While it isn’t completely identical, if the copied parts are the core message, you would definitely get swiped by the Panda. And then we have pages that jam-packed with ads, which results in less unique content. I’m talking about pages that have ads screaming at you from most conceivable angles. If you’re looking to benefit from the maximum amount of ads while getting your page to rank, then I have bad news for you. There has been news of an unconfirmed Google ranking update called Fred who shreds websites with low-value content and prioritizes earning revenue. Sites supposedly targeted by Fred reported a strong traffic decline from Google organic search. We’re talking about 50% to 90% of traffic drop. Besides obvious ads, other types of revenue generation like affiliate models and lead generation are also said to be affected. So don’t think that Panda is the only one out to get you. If you want your pages to be considered high quality, you must have at least the same amount ratio of unique content compared to the number of ads. Above all else, your content must be aimed at helping users because that’s what they’re supposed to be for. So, thin content and duplicate content are not the same. However, they’re both content issues that would lower the quality of your pages and ultimately cause you to be taken less seriously by Google. And that’s definitely something we don’t want. Search engine bots are entirely different entities. They don’t function like us and therefore will not understand and categorize websites the same way. They figure out what your website is all about by crawling the content. The best way to establish authority and credibility on your chosen topic or industry is to have your SEO content rank high for it. The more your content focuses on your niche, the easier it is for the crawlers to index and categorize and decide how relevant and serious you are for it. The opposite is also true. 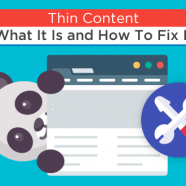 Thin content is a content issue and would render your SEO efforts less than effective. It also slows down the user journey and makes it harder for them to find what they are looking for. Imagine your content as a scrumptious dish you are trying to cook that will appeal to not only users but also Google. If your dish is lackluster and or dull, you can choose to improvise and expand your dish through more ingredients that compliment the dish and makes it better. For example, if your product page is thin, you can add unique content in the form of a detailed explanation. Your readers would be able to find information on your page without having to leave the page. This would be useful to your readers and helps make your site look good in Google’s eyes. It would probably increase the chances of you making a sale consumer-wise too. Sometimes, your recipe may already have all the important ingredients for the dish but it could have more to do with how it looks like as a final product. So what you can do is take all the information that you already have and present it in a manner that is more easily understood and more purposeful. Essentially, you rewrite it. Make sure it’s well-written with relevant information and not just keyword packed. If none of those works for you, then perhaps it’s time to consider that there might be a problem with the recipe. Why not try replacing it with another one that could work better. For your content, this means to scrap the whole thing and write in new content. After all, your dish must appeal to readers for you to rank high. If all else fails, then you can always give up and consign your dish to the bin. Rather than letting your content issues bog down your ranking, it’s better to remove it. However, do it with a lot of care. Removing huge sections of your site would be the equivalent of amputating your body parts and may cause negative SEO effects instead. There are some tools that can help identify and prevent duplicated and thin content. This is AI-powered and is used commonly to help detect writing mistakes. Simply enter your content and it will function as a proofreader and a plagiarism checker. The proofreader would make your content that much more reader-friendly and the plagiarism checker can crosscheck your content against billions of web pages and detect if there are plagiarized passages. Fix the plagiarized passages and your content issues will become less of a target to Panda. It’s nifty for pages that are already published. Just enter your URL and Copyscape can tell you if anyone has copies of your web pages online, and if you’ve plagiarised off someone’s content.The free option is limited to checking these but it’s a convenient tool to have at your disposal. Not to toot our own horn but it’s a great tool to have during your writing process. So if your aim is to expand, rewrite, or replace your thin content, you can give this a try. Just for Panda avoidance, SEOPressor helps you keep your content length, keywords to content ratio, and readability ideal. I’m a fan of preventing issues and with this tool, you address problems before it becomes one. It’s essentially a free version of SEOPressor albeit with fewer functions. It’s more than sufficient if you want to compose your content from scratch and head to a mostly Panda-free zone. The goal is to give a great impression to Google that your content is rich and unique. There aren’t any tools that can be considered a thin content tool in the sense that there isn’t yet a machine that can help you to produce unique content. However, you can find a duplicate content checker quite easily. We really only need time, experience, and research to help identify thin and duplicate content and make them better. It is also in your best interest to understand that Google wants to present the best and most useful answers to users. To combat possible future updates, you can also ensure your site is engaging and of high quality. Creating great content may even help you to rank better! An up-to-date list of SEO tools for every marketer to optimize your website.